We played that a while, and then it was time to get ready for dinner at the Monte Carlo. Instead of a traditional rehearsal dinner, Martin and Jeanene's families were having a dinner for the people who were in town Friday night. Very cool. So we got together with others headed over there, and hopped into a taxi to the Monte Carlo. The Monte Carlo is supposed to be a "quieter and classier place" and it seemed to be, as we headed to our destination. We met up with the happy couple and their families in the Monte Carlo Pub & Brewery. It was a pretty fun place, as microbreweries tend to be. And it was nice to see the families in place, though I had to confess to Martin's mother (a library employee) that I had lost the guidebook. Gasp. That, and much else, was soon forgotten as we ordered enormous quantities of beer. The giant cylinders of beer towered over the table, and Ben and Steve soon became engaged in a bet (this is Vegas, remember) over which one would be finished first. I was proud and am now a little embarrassed to say that the one on our end finished first. I engaged with a conversation with John Giglio about the meaning of modern art. Poor John. He just got into Vegas, and here he was serving as the designated artist for a bunch of drunk people (hey, it wasn't just me). But he did help give me insight into some of the things I saw on my visit to the Tate Modern last year. With respect to things like Duchamp's toilet seat, he pointed out that it was part of a conversation on the nature of art. That conversation may not involve me, and that may raise the question of why it was in a public exhibition. But that didn't mean what I saw wasn't art. Secondly, although he pointed out the futility of denying something as art (what are you going to do, argue with the artist? ), he said people shouldn't be afraid to criticize what they thought of as bad art. Cool. Then we toured the pool (much better than Excalibur's) before being asked to leave and enjoyed the convivial company. After the party wound down, we took the monorail up to the Bellagio. The Bellagio is one of the swank joints on the Strip and it showed. Our first stop was the conservatory. Filled with beautiful plants, it was what Christina called "the only real thing in Las Vegas". After a brief walk there, we were off to our next stop. Continuing my art lesson for the evening, we headed over to the Bellagio Gallery of Fine Art. Actually, instead of the permanent "for sale" collection that the gallery opened with, it now showcases a series of exhibits. The exhibit currently there is Steve Martin's collection of art. Yes, that Steve Martin. He's got a good bit of money, and has used it to collect some very nice "Modern and Contemporary" paintings. A drawing by Picasso, a Lichtenstein piece...these were some interesting works. One artist I was introduced to through this work was David Hockney, a Brit who transplanted to California. It was weird because after I saw this exhibit, he seemed to pop up everywhere...in Bill Bryson's Britain book I was reading, in a weblog I read... I don't know if it was because I started with the Tate Modern, but I've really gotten interested in modern art. I did manage to set off the alarms at one point when I pointed a bit too closely (in their opinion) at one of the paintings. Maybe the best part was the audio tour. First of all, I love those audio sticks where you punch in a number and somebody tells you about the painting. Second, the "someone" in this case was Steve Martin. How cool was that? One of the tricks of getting around in Las Vegas is knowing which casinos are owned by the same companies. See, there's not very efficient public transportation on the Strip. There's buses. There's a trolley system, which was hard to find and when Christina did find it, she said it took forever. But if you want modern mass transportation, you have to content yourself with going between casinos in the same "family." Friday morning we got up finally hungry. We wanted to try one of the better buffets in town, so we decided to head to the Paris casino. The taxi line at the Excalibur looked way too long, so we crossed the street to the MGM Grand. Well, maybe that wasn't the most efficient choice. The MGM Grand is huge -- it's the biggest hotel in the world, and the casino itself is cavernous. After working our way to the back of the property, we waited for a few minutes in the baking heat for the tram to Bally's. After a short journey via the backs of the casino's, we arrived to Bally's, our destination. Sort of. You see, instead of getting a permit to build a new casino for Paris, Bally's (well, actually the people who own the rights to the name "Bally's", but never mind because it only gets more confusing) got a permit to build Paris as an extension to Bally's. So wandering through the Bally's casino and asking three or four people for directions got us pointed in the direction of the Paris hall o' shops (with the appropriate French motif and a very similar fake sky to the Venetian). After a brief wait in line, and forking over $20/person, we were ready for the best food we'd have in Las Vegas. Wow. Here's my recommendation. If you're ever in Vegas, go to the Paris buffet. But don't eat for 24 hours ahead of the time. Everything was delicious, but it was hard for me to stuff it all in my face. Especially by the time we got to dessert. I guess Paris suffers in some reviews compared to other buffets because of the lack of variety of the food (most of it is French-themed), but oh is it good. I was a little bit turned off by the sight of people lining up to pile 20 or so shrimps on their plate -- especially because they missed the scrumptious salmon right next to it. I can't praise this food enough. After lunch, we headed back to Bally's, where we played the slots and video poker machines briefly. Christina inexplicably turned down an offer of a free drink, and then we were on our way back to Excalibur via the MGM Grand. After lunch, we went over to Treasure Island to pick up Christina's Cirque du Soleil ticket. She was going to see "Mystere" that evening while I went out with the guys for Martin's bachelor party. After that, we wandered over to the Venetian. The Venetian is really wild. First of all, it's one of the Strip's swankiest addresses. Second, the Venice theme is really done over the top. They have a canal. Indoors. On the second floor. We wandered around the canal and the impossibly expensive shops for a while, took a few pictures, and then headed back to the Excalibur. By then, it seemed time to meet up with the guys for the bachelor party. I called Ben and arranged to meet them at the San Remo buffet. I still wasn't hungry after lunch. By the time I got there, they had finished their meal, and Martin was back at the craps table. Apparently I just missed him loudly proclaiming the beauty of ham. Then we met up, and Martin and Steve, not suprisingly, decided they were worn out and needed naps. George was going to play the nickel slots, and since I wanted to join him, I went over to join the San Remo slots club. There, I joined their club (and got Christina a card for good measure) before we headed to the tables. First up, George, Ben and I took a look at the craps table. I used my knowledge of probability to outline why certain bets that they were told were bad were, in fact, bad bets. Ben described craps as a fast paced game that could have you losing or winning money very quickly. Since I wasn't really interested in risking a whole lot of money, we headed to the blackjack tables instead. I started with $100 and mostly took my cues from Ben as to when to hit or stand. Eventually I began to pick up on general rules, though I guess I really should study the strategy more carefully if I plan to play much in the future. The guy (pit boss?) came over and told us he couldn't comp us unless we bet $10/hand rather than the minimum $5/hand. I wasn't really interested in comps, but Ben and George upped to $10. The guy ended up mixing up my card with George's, which was pretty cool, except for the fact that I don't think he ended up trying to give George anything. Oh, well. Anyway, after a while I was up $80, and it was time to gather Martin, Steve and Paul for the serious part of the bachelor party festivities. I guess I'm supposed to adhere to some sort of "code of silence" about the activities of the bachelor party. Just as well; I don't have much interesting to say. The evening ended for me when Paul and I, after playing pool for a while, couldn't find anybody else to meet back up with, and headed back to the hotel. The next morning we got up and took a cab to the Imperial Palace. 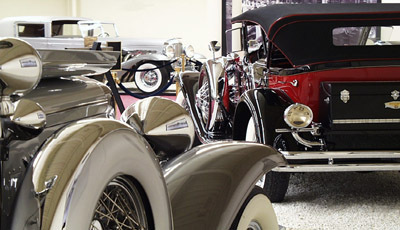 The Imperial Palace houses the Auto Collection, which Christina really wanted to see. The guidebook said that admission was $7, or free with a coupon from the casino. Seeing this, I think, "Why would the casino give us a coupon? Let's pay the $7." Christina, on the other hand, thinks, "Where can we get the free coupons?" So she -- get this -- asks people. And gets the free coupons. Huh. Well, live and learn. I'm going to get all sorts of hits from people searching for "popemobile" now, aren't I? After that, it was across the street to Caesars Palace for lunch. We had a lot of trouble getting into Caesars Palace. No, not the dress code (this is Las Vegas). Rather, all the construction that they have going on. After a while, we made our way in and through the casino (the number one rule of Vegas is that you have to go through the casino to get anywhere) to the Forum, their set of shops. I'm not sure who comes to Las Vegas to go shopping -- people with too much money, I guess. Which describes Las Vegas' favorite visitors in general. We headed to The Palm. Now, I've eaten better food -- I ate better food elsewhere on this trip -- but I'm not sure I've eaten in a restaurant with better service. The staff was very attentive, but they made us feel very welcome. Usually, I would say "nice restaurant" + "good service" = "me feeling uncomfortable." But these guys were great, and served the most ridiculously large quantities of food imaginable. I couldn't even finish my giant hamburger, and I wasn't hungry for the next 20-odd hours. An offhand remark by Christina about her birthday led to the staff bringing out a slice of cheesecake with a candle on it and singing "Happy Birthday". All in all, a great time, and perhaps the highlight of the day for me. I've posted some pictures from my trip to Casa Grande National Monument. They're available in a Yahoo! Photos album. Well, I'm back and starting to recover after a few fun-filled days in Las Vegas for Martin and Jeanene's wedding. I actually cut myself off from e-mail and the Web for 4 days, so I'll try to post recaps in the upcoming days. The flight out on Wednesday was thankfully uneventful. I fell asleep for most of it, while Christina watched Shrek. (The only event of note was something I failed to realize until the next day -- I left the Las Vegas guide I had checked out from the library in the pocket of the seat in front of me.) We got there more or less on time just before midnight, which enabled me to wish Christina a Happy Birthday while we were waiting at the baggage carousel. After collecting our bags, we hopped into a cab to the Excalibur, our hotel. My guidebook says that Excalibur not only is designed for kids, but seems "to be both designed and assembled by children." I think that's overly harsh. The medieval theme is cute, if a bit grating after a while. And I've had far worse experiences in Holiday Inns. Moreover, the price was very nice, especially compared to what the neighboring hotels/casinos/resorts/whatever were charging. After checking in, we were hungry. Christina tends not to eat much before flying, and I hadn't had a lot that day myself. So at 1 in the morning (4 Eastern Time), we headed to one of the few restaurants the guide recommended that was still open -- America in the New York, New York casino/hotel. We walked on a bridge across the street separating the two establishments. The NY, NY casino looks pretty interesting from the outside. The "building" consists of the Manhattan skyline squashed together, with the Statue of Liberty (wearing an ESPN SportsZone jersey during our visit) thrown in for good measure. We headed straight for America, which in and of itself is rather visually compelling. It has a huge (90 ft by 20 ft) 3D map of the US hanging up over the restaurant. Fittingly for Christina's birthday, we sat under Texas. (She was born there.) They were running a crab legs & steak special, for which we both eagerly opted. The food was pretty good (much better than I remembed from America in Union Station), and the service was somnewhat indifferent. The highlight of the meal for me was the 32 oz. raspberry margarita...or rather the souvenir cup it came in (for only $4 extra). This plastic container is in the shape of the Statue of Liberty. It's so tacky. It's so Vegas. Perfect. Having filled our stomachs, we headed back to the Excalibur to rest up for the day of celebration to come.